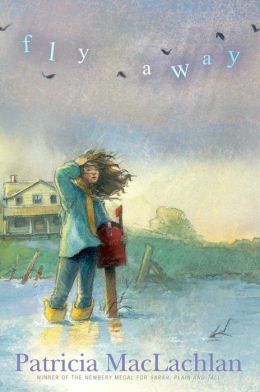 Patricia MacLachlan continues to provide emergent readers with wonderful stories. This latest book is based on the words from a children’s song that was adapted from an Engelbert Humperdinck song. It tells of the birdies who fly away, but come back home. Her main character, Lucy, is a young girl whose family is traveling back to the mother’s home in a poor, old overused, but much loved Volkswagen van with a pop-up top. Like many poor families, the children are unaware of their poverty because of the way the parents handle life with jokes and songs. During the visit home to see the stubborn aunt who doesn’t want help, the river floods. While it rises, neighbors come to help move things and memories of the past flood into conversations. The relationships between the young siblings is perfectly described. They share secrets as well as quiet strength with one another. One secret has to be shared publicly, though, when the littlest boy comes up missing. Not surprisingly, it is a well-written book that children just beginning to delve into chapter books will enjoy greatly. They will be able to recognize themselves and their relationships to others within its pages. They will learn that we, like the birdies, often fly away, but then come back home. Literacy teachers, second grade and third grade readers, librarians and parents will enjoy this book as they practice all their literacy skills, but more importantly just love reading.